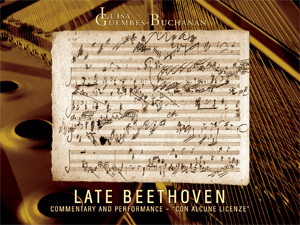 The title of this Beethoven box set "Con Alcune Licenze" (with some licences) seems surprisingly cautionary. Licences are taken by pianist Luisa Guembes-Buchanan, but with such confidence and in such sympathy with the music, that no excuses are necessary. Beethoven's late piano works make contradictory demands on the performer in almost every phrase. The music must be supple and light, but usually solemn and emotionally engaged as well. It sits on the fault line between the Classical and Romantic, obliging the performer to find their own balance between formality and expression. Guembes-Buchanan is both a scholar and a performer, and she has clearly put a great deal of thought and research into her interpretations. That's not to say they are overly intellectual, in fact they are surprisingly free and lyrical. But she communicates a real understanding of the often convoluted logic that underpins these works. She gives them the gravity they require, but without the music ever becoming turgid. And she has a wonderfully intuitive sense for Beethoven's melodies. In other hands, the innovative textures and counterpoints of this music can predominate, but Guembes-Buchanan shows that a more melodic approach can solve many of the interpretive issues without bypassing any of the music's deep emotion. The question of where "late" Beethoven begins is complex. This six-disc set gives the impression that it started out as a recording of the late sonatas, but then expanded to include pretty much everything with an opus number over 100. The second disc is devoted to the Op. 102 Cello Sonatas, with the justification that many scholars consider these works the starting point of the late style. There is certainly a stylistic continuity between the two sonatas and the rest of the music in the set. And the performance by cellist Philipp Weihrauch is very much in keeping with that of the pianist. They are both agile performers, who are able to maintain the gravity and power of the music, despite often reducing the texture and balancing the solemnity with welcome moments of lightness. The cello's intonation is flawless and the balance between the two players is ideal. Of the other five discs, three are devoted to sonatas, one to shorter posthumously published works, and one to the Diabelli Variations. It seems very generous to include so many of these fine works, and fine interpretations, as a single box. The Diabelli Variations on there own, for example, would be an equally attractive proposition, as would the cello sonatas. Bringing them together shows some interesting continuities. The last sonatas are often very episodic in their structure, with short sections based on fugue, aria and other established genres. As such, they are similar in both form and spirit to the Diabelli Variations. And the Diabelli is shown to be a profound and powerful work able to stand up to comparison with the sonatas. The recording was made at the Jesus Christus Kirche in Berlin on a modern piano. The acoustic provides the ideal balance to Guembes-Buchanan's precise touch, always warming and never obscuring. The microphones are set close to the piano, adding to the sense of engagement for the listener. The dynamic range is wide, both in the engineering and, I think, in the performance itself. That can be disconcerting, but does mean that the recording always demands the attention that the music deserves. The box this set comes in is fabulous, a real feat of paper engineering. When you slide the discs out of one side, a draw opens at the other to offer you the liner booklet. And the booklet itself is very elegant. It includes comprehensive notes from Guembes-Buchanan and is illustrated with facsimiles of the autograph scores and title pages of the first editions. It can be a bit tricky navigating the text, as the English and German versions are mixed together and randomly punctuated by pages of illustrations. But that's a small inconvenience, and otherwise this set is very fine indeed. Guembes-Buchanan gives us a refreshing alternative to the more ponderous and weighty versions of the late sonatas on the market. Yet there is nothing reactionary about her interpretations. They are as intense as anybody's, but have the grace and poetry required to make listening to six discs of this music a continuous pleasure.